Is there an industrial, mass-produced object that resists change the way that an electric guitar or bass does? Electric guitars and basses have withstood changes in consumption patterns, company ownership, construction techniques, and even fashion trends while maintaining their basic aesthetic, material composition, and to some extent, signature sound since their introduction into the American marketplace sometime after the Second World War. Together they comprise a family of very provocative industrial objects. This is because unlike airplanes, speedboats, sneakers, tennis racquets, jeans, and a host of other industrial objects, electric guitars and basses just keep on staying the same the more things change. A guitar or bass made by companies like Fender, Gibson, Rickenbacker and others has followed the same basic design for over half a decade. They all feature similar bodies, pickup configurations, tuning peg arrangements, bridge locations, and electronics. All are made of a dense wood like maple or alder, and all have rosewood or maple fingerboards. Some may have glossy or painted finishes. Fretwire is usually made out of a softer alloy. Inlays are made of mother-of-pearl or some other synthetic plastic. And there are even more expensive variants, each guitar or bass crafted from more expensive or exotic woods. These are not as widespread as the entry-level, mass-produced bass or guitar. And this leads to an important point: that there are more of these baseline Stratocaster, Telecaster, Precision or Jazz Bass guitars than, say, the $4200 bass that is manufactured to look (and sound) just like the bass that Jaco Pastorius played on all those Weather Report albums. And like any other industrial product, an electric bass or guitar sells better if played by a famous musician. This is the case even if the instrument is an inexpensive, entry-level variant. Is it possible that Ernie Ball, Inc. sold more instruments after thousands of aspiring bass players saw Flea play a Stingray bass on MTV? Of course it is. This is not to say, however, that such objects do not have any cult value, or that they are not somehow fetishized by music freaks everywhere. Far from it. In fact, no object demonstrates the value of patina like an electric guitar or bass. Patina equals more sku's. This is precisely the point made recently in the excellent things magazine, where it was observed that "Signature guitars were once the preserve of conventional rock gods, but the inevitable spread of alt culture into the mainstream has created a market for slightly more eccentric instruments, ironically productionised versions of objects that were once customised by their owners to be unique." 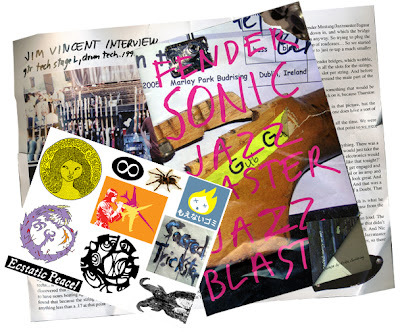 Images of some very expensive equipment—specifically from Fender's "Artist" line of instruments—were included to make this point: Sonic Youth members Lee Ranaldo's and Thurston Moore's Fender Jazzmasters and Kurt Cobain's "Jag-stang" (comprised of parts from Fender Mustang and Jaguar guitars). These instruments no doubt sounded a certain way, but it is more than likely that they are prized for the way that they looked. 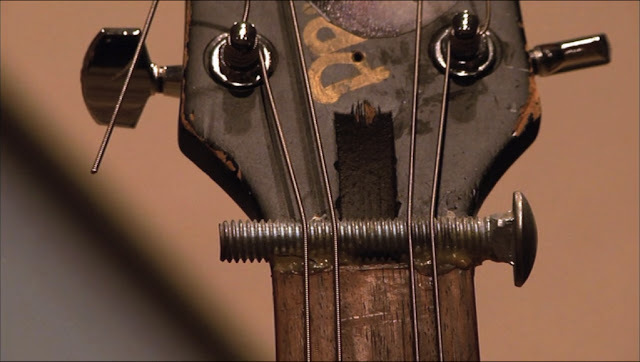 And in some instances, as demonstrated by the Jaco Pastorius "relic" bass, such instruments are crafted to look worn or beaten. It certainly presents an interesting conundrum, as these objects prove that in some instances, mass production techniques are not necessarily used to produce new, sparkling products, but rather to create and sell products that already look and seem old. It is as if issues of provenance are sidestepped by virtue of the fact that such guitars and basses can be made quickly, cheaply, and sold at a higher per-unit price. It's not that Thurston Moore owned this particular Jazzmaster. The fact that Fender can make something that looks like something Moore, Ranaldo or Cobain played is good enough. By purchasing such instruments, one also buys a ready-made narrative about a guitar or bass. 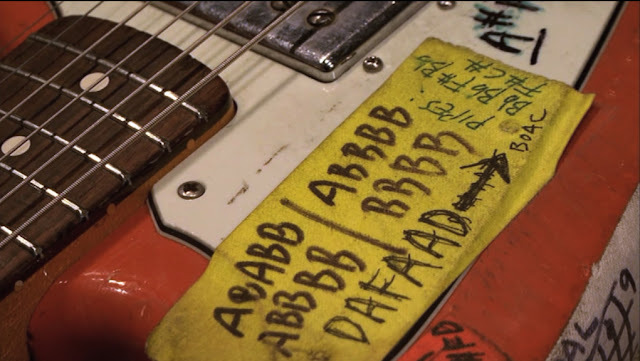 These are instruments that are manufactured according to the musician's specifications, often duplicating the way pickups are wired or how switches are bored and located. And as pointed out in things magazine, the Ranaldo Jazzmaster "comes with a custom sticker sheet and a full-color, 24 page ‘zine that contains photos, set lists, tuning charts, illustrations, tech info and extensive interviews." One could, given the right amplifier, ostensibly duplicate a specific sound from a Sonic Youth set in the 1990s. In other words, Fender is not only marketing their own version of provenance and patina: they are also selling you history. The ability of an object to elicit an emotional response in a user is the Holy Grail of industrial design. At least that is what many of the interviewees in Gary Hustwit's well-received film Objectified (2009) say in front of the camera. Design luminaries such as Dieter Rams, Karim Rashid, Paola Antonelli, and others all spend valuable camera time describing how the ability to create an emotional response is secondary to the ability to produce and sell more units. An object is fleeting, but the narrative that it can create is not. And as IDEO's Jane Fulton Suri says in the film, the ability to create such stories is a result of the users' own creativity and restlessness. Adding crushed Dixie cups to a bicycle's rear tire fenders to prevent our backs from getting wet while riding on slick streets; leveling a lopsided table with a matchbook cover to make sure our dinner does not wobble while we are trying to eat: these are practices borne out of our dissatisfaction with the things that we buy and own. These are the very things that are difficult to capture in the design and manufacturing of a consumer object. Soon after Suri's celebration of users' ability to create new narratives and uses for a product, Hustwit shows us a montage of customized industrial objects. And towards the end of this sequence, we see, in order: a closeup of an electric guitar bridge held together with epoxy and a rusty screw; a bunch of dirtied pieces of tape bearing the names of chords and tunings on the body of an electric guitar; and finally, other electric guitars sitting in a tour rack in a recording studio or in a concert venue's green room. It would be very hard indeed for even the most casual observer to note that we are not just looking at a group of Fender Jazzmasters and Jaguars. 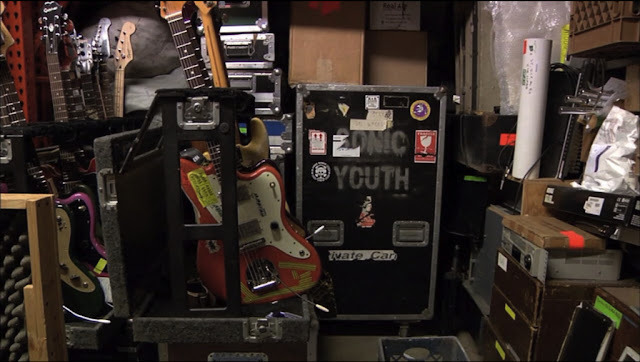 Notice the words "Sonic Youth" stenciled in the background. These are Thurston Moore's and Lee Ranaldo's guitars.